* PHDC Facebook page – follow the club on FB! FLINTSTONE, Md., Nov. 6, 2016 — It was supposed to a more difficult Fire on the Mountain 50K this year. 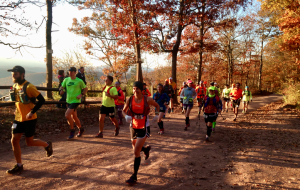 The race, a point-to-point journey in its first five years beginning in 2010, was brought back from a one-year hiatus in 2016 in the form of an out-and-back jaunt on Sunday in Green Ridge State Forest that forced runners to traverse the challenging red trail a second time, in reverse direction — and face the most punishing section over the final four miles on tired legs. For many, the 7:30 a.m. start at Point Lookout Overlook above the Potomac River near Little Orleans was a time for serious reflection. Michelle Benshoff, however, was all smiles. 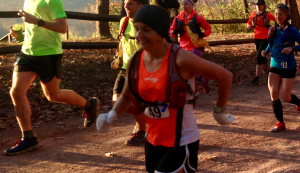 The 41-year-old from Waynesboro, Pa., took advantage of her familiarity with the course, a solid race plan, good weather and a costly mistake by first-half leader Erik Price to become the first woman to win the Fire on the Mountain ultra marathon outright. She stopped the clock and threw a log into the mountain fire after running for 5 hours, 51 minutes and 32.5 seconds — good for fifth all-time on the women’s side of the Top 10 Performance list (PDF). Benshoff edges out a 5:53:09.1 effort posted by Kari Brown, of Bedford, Pa., in the race’s inaugural year in 2010. 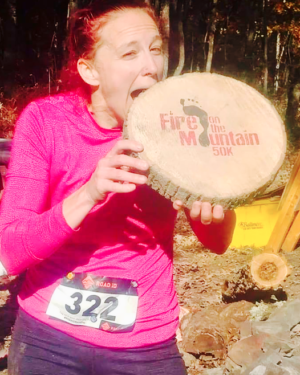 The effort also earns her distinction as the fastest female Masters (40-plus) runner to finish the Fire on the Mountain 50K in the event’s six-year history, overtaking Elisa Edgar, of Alison Park., Pa., who finished in 6:07:32.4 in 2013. Michelle Benshoff, of Waynesboro, Pa., is all smiles at the start of the 6th running of the Fire on the Mountain 50K on Sunday in Green Ridge State Forest, located in eastern Allegany County, Maryland. Price, 33, of Oakton, Va., paired with Ryan Kidwiler, 22, of Charles Town, W.Va., to lead the intimate field of 24 starters through Mile 8.9 at Aid Station 2, located at the end of the red trail (formally the Long Pond Trail). The pair worked together, with Kidwiler in first in 1:34:03 and Price a close second in 1:34:05. Mike Shoemaker, 31, of Alexandria, Va., was third through the first of four sections in 1:39:31 while Benshoff sat comfortably in fourth only two seconds back. On the green (Deep Run/Big Run) that cuts through the forest in a north-south direction along the valley floor, Benshoff made her first move by passing Shoemaker, moving into third place and putting eight minutes between her and fourth place by the time she covered the final 7.5 miles of the green trail and reached the “oasis” and race midpoint at Log Roll Overlook, high above the Town Creek view shed. But her strongest and smartest moves were yet to come. Shortly after reaching the oasis, Price headed back down Kirk Road and onto the green trail. Inexplicably, he made a wrong turn — and was able to correct himself only after logging nearly four additional miles that didn’t count. At that point, Price was frustrated and knew he was out of the race — with only a slim shot at catching Kidwiler. He tried his best. Kidwiler led Price by a shade over nine minutes at Aid Station 6, located at Mile 23.9. He cut that lead by more than half but ran out of terrain. Kidwiler finished second overall, and the top male, in 6:24:03.9 while Price settled for a frustrating third in 6:28:05.8. Both Kidwiler and Price plan to compete in the Devil Dog 100-miler next month in Triangle, Va. Price tried not to dwell on the fact of going AWOL on the course — logging a total of 36.6 miles, according to his GPS watch. Sarah Mikalauskas, 37, of New Market, was the first Marylander across the finish line and on Price’s tail, stopping the clock in 6:39:19.6. William Fallier, 43, of Harpers Ferry, W.Va., finished sixth overall in 7:15:20.6 to earn the men’s Masters title. Becky Orndorff, 46, of Hagerstown, Md., ran to the women’s Masters title in 7:57:01.6, good for 10th overall. 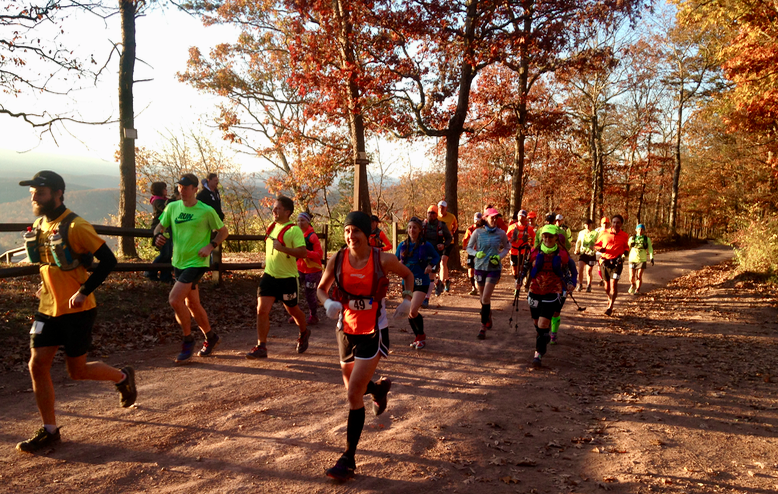 Runners take off from Point Lookout Overlook near Little Orleans at the start of the Fire on the Mountain 50K trail ultra marathon. Benshoff, meanwhile, overtook Kidwiler and moved into first place by the time she cruised through Aid Station 6, an area she knew well after participating in a training run with friend Gary Frisee in October on the same course contested on Sunday. She held a lead of nearly 13 minutes on Kidwiler — but didn’t know Price was no longer ahead of her. As the red trail split with a 1-mile section on Dug Hill Road, Benshoff asked how the race director how far behind her Mikalauskas was. The answer was nearly 22 minutes, but moments later the race director informed Benshoff that she was, in fact, in first place. Overall. “Too funny,” Benshoff noted while charging up the next forest service road hill. Benshoff glided into Aid Station 7 (Mile 27.2) — with only 5.6 miles to go — with energy on the upswing. After taking water and half a banana, she charged ahead over the next relatively easy 1.5 miles before tackling the final 4-mile assault with three major climbs. As it happened, Benshoff wowed even those who had no idea a footrace was in progress. Two hikers from Carroll County, Md., made their way in the reverse direction down the red trail to Aid Station 7 and offered their admiration to the top woman. The race director corrected them: first overall, at least so far, and with a healthy lead. They were impressed. Benshoff completed the red trail and, with no one even close, made the final assault up Oldtown Orleans Road towards the equestrian field at Carroll Road that served as this year’s finish line. The smoke was noticed first, then fire, and then Benshoff saw the finish line. She was still all smiles. After accepting her two finisher’s medals — 5-inch medallions, one each milk chocolate and dark chocolate made from a Frostburg confectioner, and a new trail running book — at the finish line, Benshoff said all she had on her mind was to not get passed over the final few miles. It turns out she had nothing to worry about. A significant and heart-felt “thank you” to event volunteers Amanda Carden, Adam Lowe, Eric Miller, Noah Spradlin, Christa Benshoff, Sherrie and Rodney Burke, Michele Jacob, Ray Hunt and Stephanie Spradlin. Events like this are not possible without the wonderful people who are so giving of their personal time to make 32.8(ish)-mile adventures a success — from preparing PB&J sandwiches (and grilled cheese sandwiches), to taking photos, to filling water bottles, to driving sore, tired and done-for-the-day runners back to the start line, delivering drop bags and more … the folks behind this year’s event were fantastic. If you know any of them, be sure to tell them what a rock star they are for being so awesome!